I am amazed at the lack of information online concerning this simple but delicious and nutritious diet. My parents and grandparents would often subsist on the fruit and bread diet especially when other foods were scarce, or they would simply have it as an enjoyable snack. Fruit alone often leaves you craving, especially if you are a native of the colder zones or climes, but combined with bread, this diet leaves you full and satisfied. Humans are naturally herbivorous and fruitarian. They were not designed to eat flesh or dairy products. Their unique biology compared to the animals and other kingdoms attests to this. They do dot have razor sharp incisors to tear through flesh nor short and flat digestive tracts for the quick expulsion of rotting meat. Nor do they have the particular enzymes to quickly digest or assimilate most dairy products. For a thorough explanation on this read the fine work entitled "Fruit and Bread: A Scientific Diet" by Gustav Schlickeysen(1877). It is one of the few books online that thoroughly and scientifically deals with fruit and bread as an ideal diet for humans. Personally, I need no convincing. I have been on this diet for over one year now and can attest to its efficacy. I tried going on fruit alone but never lasted more than 30 days. It simply did not satisfy my cravings, but woud actually magnify them. So I incorporated whole grain bread and the mix was fabulous. I also added nuts which made it even more complete, especially during the winter months when more body fuel was needed. Whenever I veered away from this fruit/bread(and nut) diet, and partook of the old cooked food or dairy diet my joint pains and other debilities would begin to resurface. So I made it permanent and am glad I did so. It is important that your fruit be raw and as fresh and chemical-free as possible and that your bread is whole grain without salt, sugar, or any other injurious condiment or ingredient. In the old days whole bread grain powder was simply mixed with clean water, kneaded, and left to rise for a few hours. Then it would be left out to bake naturally on a rock in the hot sun or heated in a stone oven. In cold climes, however, you will have to make use of your modern oven, and if you want your bread to rise you will also need some yeast or leavening agent(preferably organic). Aside from Essene manna bread, I personally had trouble finding simple whole grain bread free from salt, sugar and other unwanted ingredients so I learned to make my own. Four or five loaves can last you a month if you keep them refrigerated. Making your own bread is cheaper, fresher, healthier, and you know exactly what you're getting. Yes, I know, bread is not an entirely natural food product, but neither is our modern lifestyle. Making bread gives us something to do or keep us busy while at the same time making our largely artificial lifestyle more tolerable. It's amazing how strongly the foods we eat are tied in to our individual psychological state and the quality of our environment. If I should ever find myself in a more tropical or ideal environment then perhaps I'll be able to let go of the bread. When eating fruit and bread do not overdo on the bread. Initially, perhaps you will do this, especially if you are converting from an unhealthy modern diet, but in time you will learn to eat only enough bread to make a satisfying mix. Banana with bread is a favorite amongst many, as is apples or grapes with bread. This diet adhered to faithfully will do much to improve your health, looks, and personal disposition. It is true that in the beginning there will be an adjustment period and that you may lose a lot of weight, but this will pass. In my case, it took me just over a year for my body(and psyche) to fully adjust or normalize. It was a pleasant surprise when I saw myself gaining weight again! The time period of adjustment will of course vary from person to person. 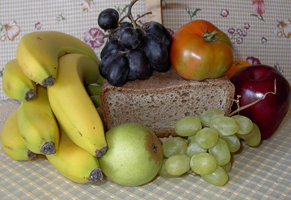 The fruit and bread diet is quick and easy to prepare, satisfying, great for your health, and will definitely contribute to a cleaner and more positive environment. You can't lose!